Picture of damage caused by the 1918, Puerto Rico tsunami. This picture was taken in the coastal area of "La Marina" in Mayagüez. The inscription on bottom leftmost part of the photo reads "la imbacion del mar" or "the invasion of the sea". The tsunami ripped houses from their foundations destroying some and others pulled out to sea when the tsunami retreated. In this picture you can see the results of the effects of the forces contained in the tsunami of 1918. This wooden house was torn from it's support columns and carried out to the sea. 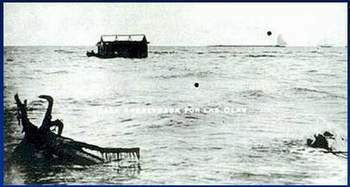 Like in this example, the 1918 tsunami cause much damage and loss of lives. Approximately 45 people lost their lives because of the tsunami of 1918 in Puerto Rico. This tsunami was caused by an earthquake of a magnitude of 7.5. Most structures at the time were poorly constructed and did not survive the attack of the tsunami. Also their location close to the sea or in flood able areas made them vulnerable. 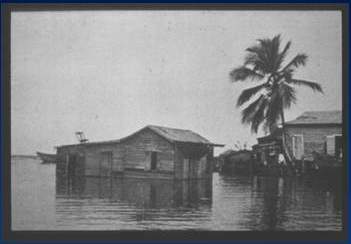 This picture is also from the 1918 tsunami of Puerto Rico. Probably shot at the Mayagüez city bay, it shows how the tsunami dragged a house out to sea. Also note the tree that was unrooted and pulled to the bay. The tsunamis can will cause destruction when they arrive as well as when they retreat. 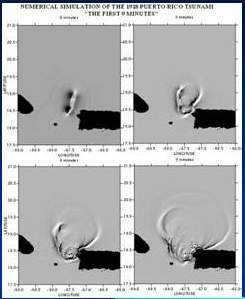 In 1997 Professor Aurelio Mercado, generated a simulation that demonstrated a possible scenario of the 1918 Puerto Rico Tsunami. The results of this simulation were compared to official reports and witness accounts. This confirmed the accuracy of the simulation because the simulation concurred almost exactly to the what really occurred in 1918.